Join Lori for the Newest Quiltworx Technique of the Month and make the Dinner Plate Dahlia. Choose one of the classes offered each month for expertise instruction. This beautiful paper pieced quilt is done is sections. Each section will be covered in class so you have the tools to complete this quilt. Call Threads Run Thru It to make an appointment prior to December 15th to use Quiltworx color program Quiltster to pick out your fabrics, or choose the available kit. 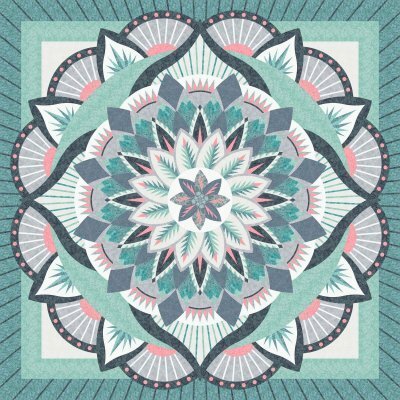 Quiltster is a computer software that let’s you personalize patterns with the fabric of your choice, gives you accurate yardage calculations and let’s you see the look of your finished quilt before buying supplies! Currently the pattern has not been released but you may sign up to be on the list for the class and when pricing becomes available we will update the information.